Genetically Modified Crops Flourish Globally - Dawn of a new imperialism? Genetically Modified Crops are more widespread than ever and here to stay, according to a recent report from the International Service for the Acquision of Agri-Biotech Applications, a bioengineering trade group. 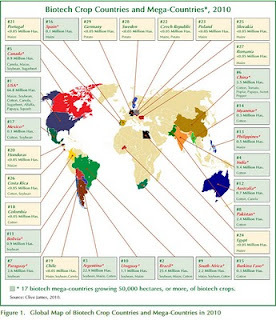 1 billion hectares of Genetically modified organisms were planted in 2010, marking a stunning adopting of GM crops since their introduction in 1995. Clive James, ISAAA's director and founder, told the BBC that more than 15 million farmers grow GM crops, and that, "during 2010, the accumulated commercial biotech plantation exceeded one billion hectares [2.47 billion acres]— that's an area larger than the U.S. or China," and equivalent to 10 percent of the world's arable land. Its troubling to see that developing nations are planting GMOs at more rapid rate than developed nations. Multinational Corporations such as Monsanto profit tremendously off the adoption of patented GMOs, which are typically designed not to produce seeds which the farmer can reuse. This forces farmers in poor nations into a desperate cycle of mortgaging the farm to buy seeds from Monsanto. Often, Farmers who choose not to switch to GMO seed are forced to when their fields become pollinated from adjacent fields of GMOs. Once GMOs are in natural they cannot be contained, so hopefully they will not cause unforeseen consequences of a tragic nature. Regardless, its an excellent way for corperate hands to reach into the pockets of subsistence farmers around the globe by taking away what nature intended to be free: seed. While we don't know if GMO crops are safe, it does appear that they are here to stay. Three helpless cheers for progress! Pacific Beach: Classic San Diego! San Diego is a great city, and one of my favorite neighborhoods is Pacific Beach. Sandwiched between La Jolla, Mission Bay, and the I-5, PB is a neighborhood of apartments and bungalows teeming with 20-somethings and families. Garnet Street is the main business district of the area, and is lined with cute shops and restaurants to explore. The streets are arranged in a grid fashion, and many have views of Mission Bay to the south and the ocean. Garnet ends at the beach in Crystal Pier, a combination pier/hotel which features over-water cottages for rent. Its beautiful to walk out, and you can feel the pier rock beneath you during heavy surf. Crystal Pier hotel with PB and Mission Bay in the background. 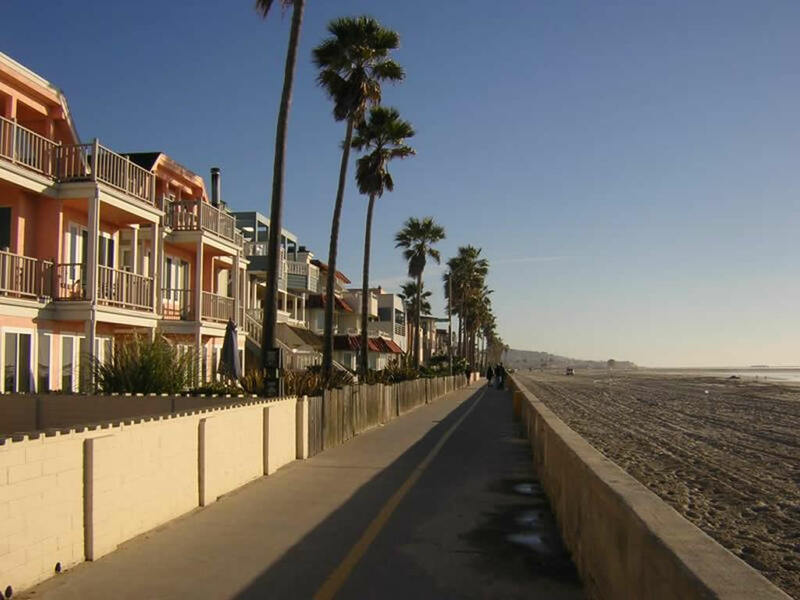 Pacific Beach has a long boardwalk along it which is great for walking, jogging or biking. Many beautiful houses line the waterfront, giving the whole area a festive, lively attitude. It can be nice to work up a sweat jogging along the beach and than jump into the cool surf to cool off. Just make sure to watch out for stingrays! They can be quite common and do sting if stepped on. Locals recommendatory doing the 'stringray shuffle,' which involves dragging one's feet on the underwater sand to alert the stingray and give it time to get out of your way! 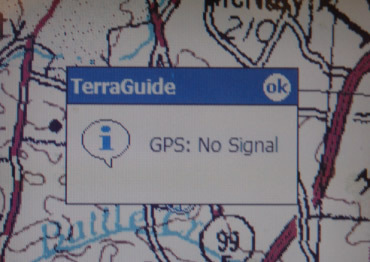 Will 4G break your GPS? All four major US cell carriers are beginning to roll out '4G' service via LTE or Wimax, and engineers are worried that GPS coverage will be disrupted over large portions of the country. Apparently, 4G and GPS satellites use similar areas of the spectrum, and when the two types of units get close, 4G signals win. "The [handheld] GPS began to experience interference when 5.8 km or closer to the simulated transmitter and lost the fix altogether when 1.1 km away. Interference started at 22.1 km for the aviation receiver, and total loss of fix occurred at 9.0 km from the transmitter." The U.S. Air Force has also expressed concern over likely GPS disruption, but is optimistic about working with 4G infrastructure provider LightSquared to remedy the issue. Lightsquared Spokesperson Jeff Carlisle said that the 4G base stations are not at fault. 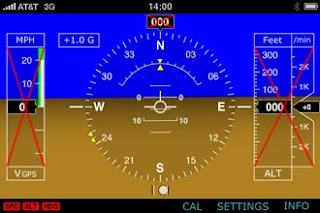 Instead, he explained that some GPS units can 'see into' adjacent frequencies, including the one which Lightsquared uses. Navigate Santa Barbara's bus system using Google maps! Google Transit has been steadily expanding to include 448 cities around the world. Transit is part of Google Maps, and it plans trips based on public transit's schedule, route, cost, and will even estimate walking distances to and from each stop. It makes a great way to plan a transit trip in an unfamiliar city, or compare the travel times or taking the bus versus driving or biking. Santa Barbara's MTD was recently added to Google Transit, and I have been using it every day to plan my trips to and from school. Now only if there was an android app for SBMTD's schedule. Southern California is an urban jungle. This connurbation is among the largest in the United States, and extends from Santa Barbara County to Tijuana, Mexico and east to Riverside Country and the deserts of the Southwest. Tall downtown areas are surrounded by unrelenting low density sprawl, and jammed freeways criss-cross the arid landscape. Last weekend, I drove from Santa Barbara to Pacific Beach, San Diego for a visit. The drive should have taken four hours, but traffic and weather combined to tack an additional two and one half hours of delay. Additionally, about 40% more gas was consumed that would be expected for the mileage of this trip. This makes sense considering long stretches of the drive were in first or second gear! We left Santa Barbara on HWY 101 southbound and followed this through Ventura Country and up and over EL Camino Peak into the San Fernando Valley. SFV, as it is known locally, is a conglomeration of suburbs bordered on three sides by mountains which seeks to differentiate itself from LA by offering residents a higher quality of life than locations closer to the city. In the SFV, I got on interstate 405 heading south towards San Diego, and was immediately stuck back in traffic. For the next 100 km. In in the hardest rain I have ever experienced in southern California. We passed accident after accident, as 12 lanes (each way) of traffic squeezed through this notoriously busy section of freeway. HWY 73 - Public vs. Private? On the southern end of the LA area, traffic was still brutal so I chose to take a toll road for part of the journey. Hwy 73 is privately owned and operated, and provides a traffic free, well maintained shortcut across Laguna Nigel and around urban Irvine, CA. In the picture above, you can see the 3 main N-S corridors: I-5 (left), I-405 (middle) and Hwy 73 (right). The two interstates go through flat, congested areas and are always clogged with traffic and heavily rutted with potholes. Hwy 73 is meticulously paved, and traffic is light as the highway climbs through much nicer, more exclusive neighborhoods. The trip on the toll road cost me US$4 which I paid via Fastrak transponder, but I do believe the price varies with congestion level. One nearing San Diego, I was getting tired and not paying close enough attention to the signs, and I accidental ended up on I-805 instead of I-5. The 805 was now taking me on an inland detour and was in fact heading away from my destination! Darn! Oops! Ended up on 805, grabbed the 52 back to the five! Luckily, in Southern California every freeway connects with every other freeway multiple times, so I had no trouble finding a new route to my destination. All I had to do was take 52 E to I-5 S and I was there. If I had missed the 52, I would have had several other alternate freeway routes within the next several miles. This sheer complexity of this freeway systems leaves me in awe every time I pass through. Finally! Got of the 5 and headed west into Pacific Beach! 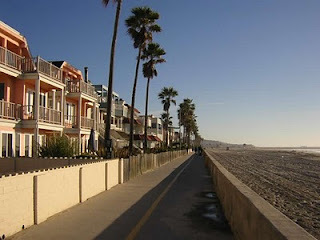 Come back next time for more info about the darling beach neighborhood of Pacific Beach! It's Southern California at its finest! Elevation and Speed Profile - Spent a lot of time in traffic on this trip! Thanks to http://www.maproomblog.com/ for the lead! 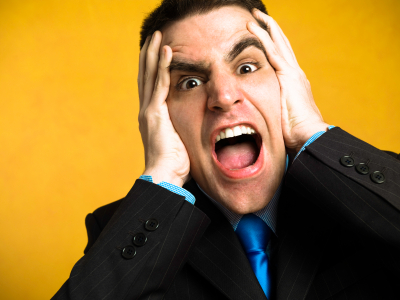 Stuck in GIS file format hell? Geographers use a wide variety of devices which record information in many different ways. For example, my GPS Unit records track data and waypoints in the GPX file format. Google Earth can import GPX files, but saves data as a KML file. File conversions can leave you cross-eyed! This creates a problem in my geoloation workflow: if I create a route in google Earth, I cannot save it onto my GPS handheld for later use because the KML file format is not compatible. Luckily, a variety of free file convertors are available for converting to and from all sorts of GIS file formats. I have been using GPS Babel to convert KML files to GPX files. Its free, and has an easy to use web interface! You can also download the original command line version for use in the field without an internet connection, but, its more complicated UI has a steep learning curve. GPX files are pretty cool! When opened in a text editor, it will open as a list of dates, times, and lat/long data. Basically, a text trail of bread crumbs to reconstruct your track. I have tried editing these files by hand (to remove part of the track, for example) and have had very limited success. GPX file as viewed in text editor. Not Particularly useful. 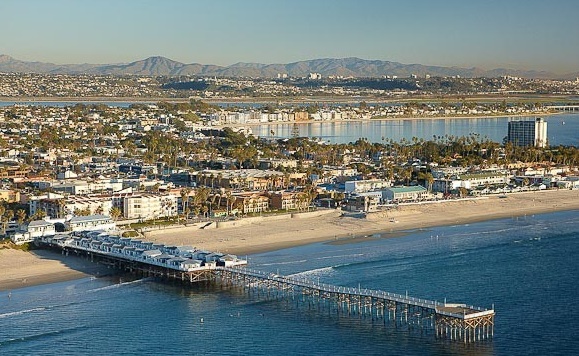 Southern California has a large population which is mostly clustered along the coast. Huge expanses of undeveloped open space exist inland, populated only by those resillent and self-reliant enough to handle the isolation. Maricopa and Pine Mountain Club are two towns which stand alone as distant outposts of the southern California conurbation. I had to go exploring and see what was out there, and I found a lot of empty, calming beauty. I started by wandering down hwy 101 from Santa Barbara to HWY 150, which I took over Casitas Pass into the small town of Ojai, CA. Ojai is a quaint community in the mountains above Ventura, and has a great charm to it. I follow highway 33 north out of Ojai up and over a steep st of mountains. It was a crazy, curvy drive! After crossing Pine Mountain Pass, I drove across the flat Cuyama Valley, which has some agriculture but is largely isolated. It was breathtaking was scored with dry river beads and beat-up old roads. I followed one such road off the east side of HWY 33, and the scenery was breathtaking. It was a dirt loggin track, and my car was only able to go a little ways before the terrain got too rough. we climbed to the top of this! We followed hwy 33 North and East and we tempted to turn off on the twisting Cerro Noroeste Rd., which turned into Forest HWY 95 and started to climb up the edge of a sheer valley. The temperature started to drop, and the road got steeper and steeper with rocks and ice everywhere! Forest HWY 95 led to the tiny community of Pine Mountain Club. This town is tucked away at the foot of a huge mountain, and is located at about 1500 m elevation. It was COLD and there was snow on the ground! Spectacular! PMC is a small, privately owned community. The house were very cute, and the streets were steep and surrounded with evergreen trees. The Range above Pine Mountain Club. the peaks reach close to 2500 m above sea level. After leaving Pine Mountain Club, we headed back down the way we came, and turned back onto HWY 33 continuing East toward Maricopa. A steep, sudden grade took us down into the valley, and Maricopa slowly revealed itself on the horizon. It was a small, sleepy town on the edge of the immense central valley of California, and the buildings were sparse and drab. The area has had a weak economy which has veen closely tied to the booms and busts of oil and gas drilling in the area, and now does not look like such a good time in Maricopa. Still, it was a beautiful piece of California which is definitely off the beaten path! Thanks for the read! More info about this trip to come soon! Visit Museo del Prado in Spain! Google recently launched a virtual tour of a variety of museums around the globe. You can view the floorplan of the museum and even look at high quality reproductions of the works contained within. 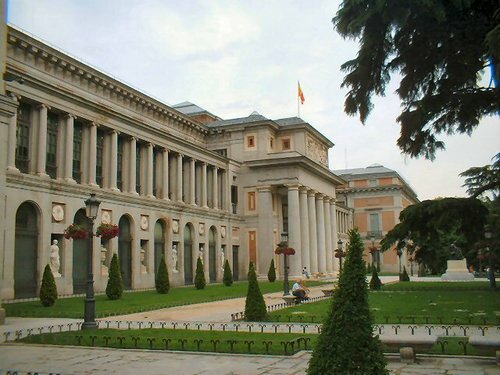 On such museum, The Prado Museum in Madrid, Spain houses a world class collection 12th-19th century European art. Founded in 1918, the museum has over 7,000 pieces, although due to space limitations only about 1300 are on display to the public. The quality of the images are truly breathtaking. When an image is selected for viewing in Google Earth, if flies the viewer to where in the building the work is located, giving one a sense of the museum's layout. I would highly recommended checking out this museum yourself in Google Earth. So far, its kind of buggy and takes powerful hardware to render properly, but it is worth the patience! Check out the Google Art Project website here to see more museums and works. You can move around the museum and view the works in high resolution! You can also view the museum's exterior detail in Google Earth. I imagine that Art Project will eventually merge completely with Earth. Google has already rendered the outsides of most buildings, so it makes sense that they'll work on the insides now! I woke up feeling patriotic this morning. There is no better way to honor one's country than by checking out the capital. I wsan't feeling up to flying there, so I'd figured Google Earth could take us. Lets see what we find!! Washington D.C. has some gorgeous buildings, and the mall area itself is a wonderful urban space. Its obviously worth a visit if you've never been. Special thanks to the Google Earth community for all this wonderful 3D building imagery that has been created! A lot of America's cities are starting to look very realistic.